Aphasia is a neurological disorder caused by damage to the portions of the brain that are responsible for language. Primary signs of the disorder include difficulty in expressing oneself when speaking, trouble understanding speech, and difficulty with reading and writing. Aphasia is not a disease, but a symptom of brain damage. Most commonly seen in adults who have suffered a stroke, aphasia can also result from a brain tumor, infection, head injury, or dementia that damages the brain. It is estimated that about 1 million people in the United States today suffer from aphasia. The type and severity of language dysfunction depends on the precise location and extent of the damaged brain tissue. The most common cause of expressive aphasia is stroke. A stroke is caused by hypoperfusion (lack of oxygen) to an area of the brain, which is commonly caused by thrombosis or embolism. Some form of aphasia occurs in 34 to 38% of stroke patients. Expressive aphasia occurs in approximately 12% of new cases of aphasia caused by stroke. In most cases, expressive aphasia is caused by a stroke in Broca's area or the surrounding vicinity. However, cases of expressive aphasia have been seen in patients with strokes in other areas of the brain. Patients with classic symptoms of expressive aphasia in general have more acute brain lesions, whereas patients with larger, widespread lesions exhibit a variety of symptoms that may be classified as global aphasia or left unclassified. Expressive aphasia can also be caused by trauma to the brain, tumor, cerebral hemorrhage by extradural hematoma. Understanding lateralization of brain function is important for understanding what areas of the brain cause expressive aphasia when damaged. In the past, it has been believed that the area for language production differs between left and right-handed individuals. If this were true, damage to the homologous region of Broca's area in the right hemisphere should cause aphasia in a left-handed individual. More recent studies have shown that even left-handed individuals typically have language functions only in the left hemisphere. However, left-handed individuals are more likely to have a dominance of language in the right hemisphere. Damage to the temporal lobe (the side portion) of the brain may result in a fluent aphasia called Wernicke's aphasia (see figure). In most people, the damage occurs in the left temporal lobe, although it can result from damage to the right lobe as well. People with Wernicke's aphasia may speak in long sentences that have no meaning, add unnecessary words, and even create made-up words. For example, someone with Wernicke's aphasia may say, "You know that smoodle pinkered and that I want to get him round and take care of him like you want before." As a result, it is often difficult to follow what the person is trying to say. People with Wernicke's aphasia usually have great difficulty understanding speech, and they are often unaware of their mistakes. These individuals usually have no body weakness because their brain injury is not near the parts of the brain that control movement. A type of non-fluent aphasia is Broca's aphasia. 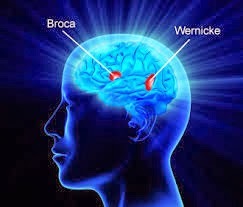 People with Broca's aphasia have damage to the frontal lobe of the brain. They frequently speak in short phrases that make sense but are produced with great effort. They often omit small words such as "is," "and," and "the." For example, a person with Broca's aphasia may say, "Walk dog," meaning, "I will take the dog for a walk," or "book book two table," for "There are two books on the table." People with Broca's aphasia typically understand the speech of others fairly well. Because of this, they are often aware of their difficulties and can become easily frustrated. People with Broca's aphasia often have right-sided weakness or paralysis of the arm and leg because the frontal lobe is also important for motor movements. Another type of non-fluent aphasia, global aphasia, results from damage to extensive portions of the language areas of the brain. Individuals with global aphasia have severe communication difficulties and may be extremely limited in their ability to speak or comprehend language. There are other types of aphasia, each of which results from damage to different language areas in the brain. Some people may have difficulty repeating words and sentences even though they can speak and they understand the meaning of the word or sentence. Others may have difficulty naming objects even though they know what the object is and what it may be used for. Global aphasia results from extensive damage to the brain's language networks. People with global aphasia have severe disabilities with expression and comprehension. With anomic aphasia, the person has word-finding difficulties. This is called anomia. Because of the difficulties, the person struggles to find the right words for speaking and writing. 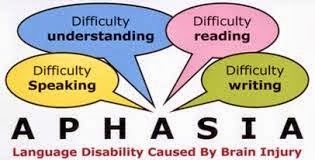 Primary progressive aphasia is a rare disorder where people slowly lose their ability to talk, read, write, and comprehend what they hear in conversation over a period of time. With a stroke, aphasia may improve with proper therapy. There is no treatment to reverse primary progressive aphasia. People with primary progressive aphasia are able to communicate in ways other than speech. For instance, they might use gestures. And many benefit from a combination of speech therapy and medications. Aphasia is usually first recognized by the physician who treats the person for his or her brain injury. Frequently this is a neurologist. The physician typically performs tests that require the person to follow commands, answer questions, name objects, and carry on a conversation. If the physician suspects aphasia, the patient is often referred to a speech-language pathologist, who performs a comprehensive examination of the person's communication abilities. The examination includes the person's ability to speak, express ideas, converse socially, understand language, read, and write, as well as the ability to swallow and to use alternative and argumentative communication. In some cases, a person will completely recover from aphasia without treatment. This type of spontaneous recovery usually occurs following a type of stroke in which blood flow to the brain is temporarily interrupted but quickly restored, called a transient ischemic attack. In these circumstances, language abilities may return in a few hours or a few days. For most cases, however, language recovery is not as quick or as complete. While many people with aphasia experience partial spontaneous recovery, in which some language abilities return a few days to a month after the brain injury, some amount of aphasia typically remains. In these instances, speech-language therapy is often helpful. Recovery usually continues over a two-year period. Many health professionals believe that the most effective treatment begins early in the recovery process. Some of the factors that influence the amount of improvement include the cause of the brain damage, the area of the brain that was damaged, the extent of the brain injury, and the age and health of the individual. Additional factors include motivation, handedness, and educational level. Aphasia therapy aims to improve a person's ability to communicate by helping him or her to use remaining language abilities, restore language abilities as much as possible, compensate for language problems, and learn other methods of communicating. Individual therapy focuses on the specific needs of the person, while group therapy offers the opportunity to use new communication skills in a small-group setting. Stroke clubs, regional support groups formed by people who have had a stroke, are available in most major cities. These clubs also offer the opportunity for people with aphasia to try new communication skills. In addition, stroke clubs can help a person and his or her family adjust to the life changes that accompany stroke and aphasia. Family involvement is often a crucial component of aphasia treatment so that family members can learn the best way to communicate with their loved one. Simplify language by using short, uncomplicated sentences. Repeat the content words or write down key words to clarify meaning as needed. Maintain a natural conversational manner appropriate for an adult. Include the person with aphasia in conversations. Ask for and value the opinion of the person with aphasia, especially regarding family matters. Encourage any type of communication, whether it is speech, gesture, pointing, or drawing. Avoid correcting the person's speech. Allow the person plenty of time to talk. Help the person become involved outside the home. Seek out support groups such as stroke clubs. Other treatment approaches involve the use of computers to improve the language abilities of people with aphasia. Studies have shown that computer-assisted therapy can help people with aphasia retrieve certain parts of speech, such as the use of verbs. Computers can also provide an alternative system of communication for people with difficulty expressing language. Lastly, computers can help people who have problems perceiving the difference between phonemes (the sounds from which words are formed) by providing auditory discrimination exercises. Consider taking low-dose aspirin, if your physician recommends you do so. Keep existing conditions, such as diabetes and High Cholesterol , under control.